Playwright Robert Myers brought his play, Mesopotamia, to the Whitney Humanities Center on October 21 and 22 in an international collaboration between the Council on Middle East Studies at Yale, the American University in Beirut, the Whitney Humanities Center, and the World Performance Project at Yale. The play focuses on the life of Gertrude Bell, one of the makers of the Middle East as we know it today and a controversial character that allows parallels to the current U.S. engagement in that region. Gertrude Bell, along with her colleague T. E. Lawrence, was one of the best-known and most renowned European Arabists of the early twentieth century. The second woman to graduate from Oxford, she traveled extensively throughout the Middle East, learning Persian and Arabic, and training as an archaeologist. Shortly after the turn of the century, she led important archaeological expeditions to Syria and Iraq, subsequently writing highly regarded and popular accounts of these expeditions. During and immediately after World War I, Bell served as Britain’s Oriental Secretary of Iraq. She became deeply emerged in a crucial period of post-WWI in the Middle East, when Britain and France, the dominant colonial powers of the region, created the nation states of Syria, Jordan, Lebanon, and Iraq. Gertrude Bell was responsible for drawing the borders of the state of Iraq, engineering the accession to the throne of King Faisal, helping to quell the insurrection of 1920, and founding the Iraq Museum. The ambiguities of Gertrude Bell’s personality become apparent when she committed suicide in Baghdad in 1926 at the age of 56. Mesopotamia is set in the British Oriental headquarters on the banks of the Tigris River in Baghdad during the early 1920s and dramatizes the creation of Iraq, the violent insurrection of 1920 and Gertrude Bell’s Machiavellian political maneuvering. An expert on the region and its languages, Gertrude Bell acts primarily as the liaison between the British Civil Commissioner Sir Percy Cox and the various political parties and groups that were active in Iraq during this time. Never in doubt about her loyalty to the British Empire, the play shows how Gertrude Bell, who was well aware of the effects British policies had, is torn between her admiration of the Orient and its people and the interests of her home land. The plays lends itself to draw parallels to the U.S. engagement in Iraq after the 2003 war, when regional experts from U.S. universities became advisers to the U.S. military administration in its dealings with the Iraqi people and the reorganization of their state. 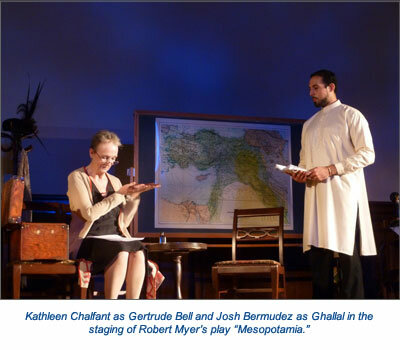 The staged reading featured Kathleen Chalfant, one of the most acclaimed stage actors in the U.S., as Gertrude Bell and was directed by Evan Yionoulis, Resident Director of the Yale Repertory Theater. Joe Urla costarred, along with students at the Yale School of Drama. They played to a combined audience of about 200 Yale and New Haven community members. The casting call went out to the entire Yale community, and students and members of the Yale community worked as sound, lighting, and costume designers on the project. Each evening after the reading, actors responded to questions from the audience that ranged from what they learned about Gertrude Bell and Iraq as they prepared for their roles to what acting in the play meant to them personally. The initial idea for this collaboration came from a 2009 Yale Arab Alumni conference at the American University of Beirut, where Marcia Inhorn, then chair of the Council on Middle East Studies, indicated she was looking for an arts-related project to bring to Yale as a part of their U.S. Department of Education National Resource Center Title VI grant. Robert Myers, then chair of the English Department at the American University of Beirut, responded with this proposal. Due to the support of Maria Menocal, director of the Whitney Humanities Center, Robert Myers became the Franke Visiting Fellow at the Center in the fall of 2011. Myers also curated an exhibition about Gertrude Bell in conjunction with the presentation of the play. This exhibition, “Gertrude Bell in Mesopotamia: Archaeologist, Arabist, Diplomat, Spy,” has been on view at the Whitney Humanities Center since September 26 and will continue through December 16, 2011. Minjin Hashbat, PIER Director at the MacMillan Center, has worked with Elizabeth Payne (Near Eastern Languages and Civilizations) and Karen Foster (History of Art) to bring the world of Gertrude Bell to New Haven Public School students through tours of the Gertrude Bell in Mesopotamia exhibition. In addition, Robert Myers presented a lecture on “Teaching History through Theater” to K-16 educators. Students and educators also attended the play. Further information about Mesopotamia can be found at: www.robert-myers.com (especially an excerpt from the play on the “Plays” page and the article entitled “Gertrude Bell and the Pacification of Iraq” on the “Articles” page). Many of the letters and photographs in the Newcastle collection can be accessed directly at www.gerty.ncl.ac.uk.